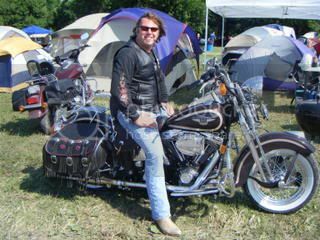 This past weekend we went to the 24th Annual Abate Freedom Rally in Algona, Iowa. What a party. About 30,000 Bikers on 123 Acres of land that the Abate of Iowa owns. Many people take freedom to a whole new level. Us girls have fun dressing up in different themes every night. This night was school girl night and I was the Head Mistress. My girlfriends brother is a Tattoo artist and he had a booth set up. What an artist. 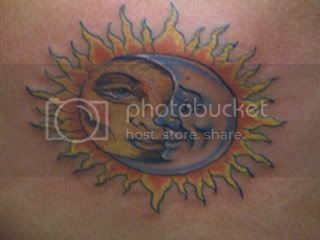 The worst, or should I say painful, part about the tattoo is the outline. Once that is done it isn't so bad. OK, not as painful. I'm really happy with how it turned out. 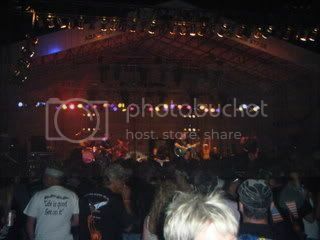 After that was done we went up to watch Joe Diffie. He sings "Prop Me Up Beside the Jukebox When I Die." What a great concert. 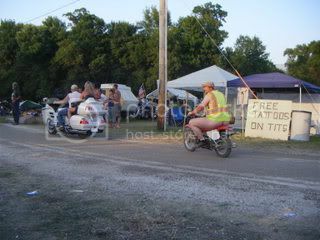 We are already looking forward to next year's 25th Annual Freedom Rally. Freedom isn't Free. Many men and women have faught for our freedom and for that I say Thank You!! Nice tattoo Brenda. It looks kind of like the first one Tara had done. I had to laugh, that festival, "Abate Freedom" sounds like "nip it in the bud!" Carl...Heritage Springer 95th Anniversary Addition. I surprised Biggy B with it for his 31st Birthday!! Then the next year I bought a 2002 Duece. I make a terrible passenger. Biggy B says it's a control issue.